2 Do I have to pay a fee to participate in the program? 3 Why is the program free? 4 Why are companies interested in candidates who are certified by Verify.Wiki? 4.1 Do you have tutorials on how to edit and verify articles? 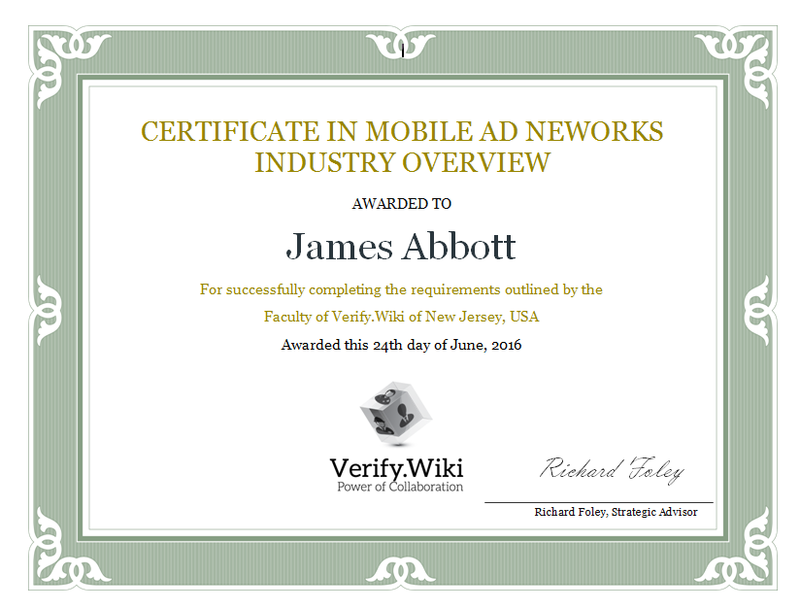 Verify.Wiki's Certificate in Mobile Ad Networks Industry Overview (free) has helped hundreds of candidates excel in job interviews and land jobs in Fortune 1000 companies. In this program, instead of learning about the theory, you learn about the industry and companies who are in the business of mobile ad neworks, which provides students a new practical perspective on "Mobile Ad Networks". The transparent and collaborative nature of Verify.Wiki's courses provide instant credibility to candidates, helping them do better above all others who apply for a job with a generic theoretical background. Do I have to pay a fee to participate in the program? Verify.Wiki makes money by referring and placing potential candidates who excel in the program to companies. Why are companies interested in candidates who are certified by Verify.Wiki?